The Giant Burrowing Cockroach is a detritivore, and plays an important role in keeping the rainforest clean by eating dead plant material. Green Tree Frogs are predators and second order consumers, feeding primarily on invertebrates. Sugar gliders find refuge in hollow trees in the temperate bushland habitat, and are omnivores feeding on fruit, nectar and insects. The Victorian Carpet Python is a carnivore, prefering to eat small to medium sized prey like possums and rodents. Living in a desert environment can sometimes result in food being scarce, but the fat stored in the Shingleback’s tail help it to survive in tough conditions. 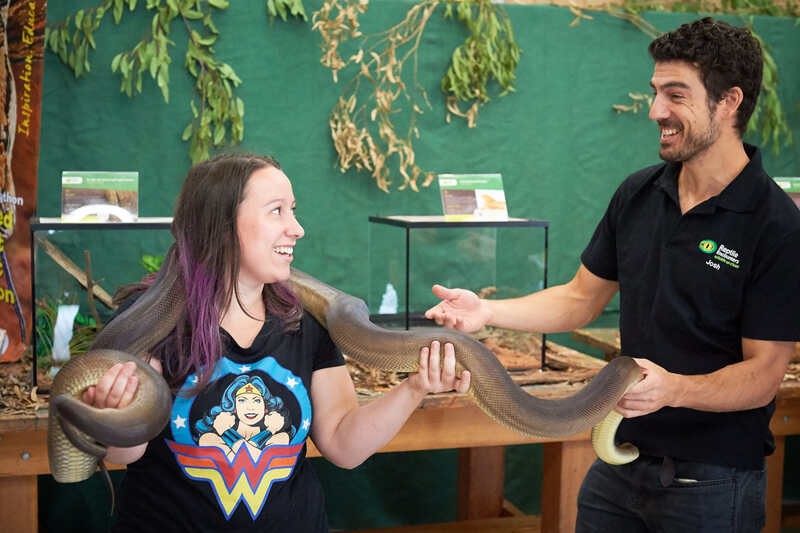 The Olive Python could be considered a third order consumer, as it can feed on large prey like wallabies, but larger animals could still eat it. The Broad-shell Turtle has the unique ability of cloacal respiration, breathing through its bottom, to help it to stay underwater longer when searching for food and avoiding predators. The Freshwater Crocodile lives in a wetlands environment, and is an apex predator sitting on top of the food chain. How do different types of animals live in similar habitats together? What sort of relationships form between species? How are some ecosystems similar and how are others different?